I felt I need to post this. So here it is. Happy Miku Day! Basically, every yesr on 9 March it is the day of Hatsune Miku. The reason behind this is that Miku can be written as 39 in Japanese. Alternatively, it is possible to read 3 9 as Miku. And that is why today is Miku Day. To celebrate it means to listen to her songs obviously. An excellently illustrated anime with an engaging storyline that will captivate you right from the very start. The innocent love, misunderstandings, humour and everyday life is excellently portrayed thorughout the anime. It's a new school year and Ryuuji Takasu discovers that not only is he in the same class as his best friend, Yuusaku Kitamura, but also Minori Kushieda whom he's had an undisclosed crush on for quite some time. Along with the two of them comes the “Palmtop Tiger”, tiny Taiga Aisaka and Minori's best friend. Despite her small stature, Taiga takes nothing from anybody and is secretly in love with Kitamura. Ryuuji and Taiga, despite their oil and water relationship, agree to mutually support each other in their quests for their hearts' desire. 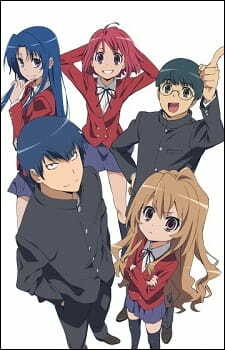 Not many anime has successfully captivated me as much as Toradora! did. The incredible humour with a variety of interesting characters kept the story rolling on right till the end. Even the misunderstandings, plot twists and rivals were interesting to watch. The character development was retold really well, without missing a point. In the end, all I can say is, love is such a complicated thing and this anime complicates it even more so, but to a certain comprehensible degree. The art style of the characters was slightly plain, however, the beautifully illustrated sceneries and backgrounds made the anime alive. Realism wasn't a major aspect of this anime, so the different coloured hair styles featured on the characters made little difference in presenting the story overall. You will come to love the art style as you watch each episode. I thought that the voice acting and the theme songs were excellently recorded. The theme songs were appropriate for such an anime and it was catchy as well! I felt that the voices of the main characters were more memorable than some of the other anime I have watched. Characters are of some variety here. Not over-the-top personalities yet not so boring. It can be said that it is more 'realistic' to an extent. I loved the main character, 'Taiga'. She was the 'tsundere' type in this anime. I do have a thing for 'tsundere' types but to an extent. 'Taiga' was portrayed extremely well and her personality definitely suited her best. Other characters in the anime were presented really well, with the main character playing his part appropriately in the many awkward situations. You will come to love the main characters as a whole, and not just a single person as this anime focusses on the characters as a whole rather than individually. Overall, this anime was funny from the start to end. It got serious when love triangles, squares, pentagons (and whatever many sided shaped polygons you can think of) appeared. However, the humour stayed and the characters will make you even enjoy this anime more. The art style was decent enough to get used to but the nice sceneries make up for lost content. The theme songs were definitely catchy and may be slightly random but it all makes sense in the end. I for one, loved this anime to the top of my 'Slice of Life' anime list. It was one trill of a ride from start to finish with many hilarious and embarrassing scenes. You will not get bored. The characters were decently drawn however the scenery was excellently illustrated. Catchy theme songs with slight randomness in them. The voices of characters were memorable though. You will definitely come to love the main characters as they deal with everyday life with love. I loved it, it was funny and innocently cute. The story was engaging and I did not get bored at all. Definitely a must-watch if you are into slice of life animes with comedy and romantic elements thrown in. The mix complements each other really well and in the end, you get a sweet taste of satisfaction.